I owned an XS1B back in the early '70's. Don't know how many miles I put on it, but it did make it from San Jose, CA to Fort Bragg, NC in 6 days. They are a great bike for the format, a twin with both pistons going up and down at the same time. Yes, you can watch the front tire almost bounce as the bike idles, but it handles well, is reliable, and easy to ride. Most HD riders DID hate them, for the same reason they hated Brit bikes. The 650 would out handle and outrun most 72ci HD's of the day! If I didn't get hooked on drive shafts, I might go back to a 650 twin! '99 Altima, rain vehicle with ft8900. The early bikes carb sync was two cables from the throttle grip very hard to sync and keep it set. 76 was the first year Yamaha linked the carbs with a bit of angle iron. This kept the carbs set/synced, the trick was a super sync, done right, vibration (as the XS650 Society says, what vibration ?) is at a minimum then gearing comes into play, stock rear sprocket is 34. I ran my 77 with a 40 rear and that came off in place of a 32 in less than 100 miles, it took parts off like a Triumph (turn around and pick up what fell off). So many things can be added or modified, and speed/pickup/handling, with stock gearing will actually scare how really fast they handle like a big bicycle, especially the models with 19" front and 18" rear. On the other hand, nothing will keep up with the XS1100 like the 750 Seca and if you can find one the 900 Seca. [quote=donebysunday;510311]The early bikes carb sync was two cables from the throttle grip very hard to sync and keep it set. 76 was the first year Yamaha linked the carbs with a bit of angle iron. This kept the carbs set/synced, the trick was a super sync, done right, vibration (as the XS650 Society says, what vibration ?) is at a minimum then gearing comes into play, stock rear sprocket is 34. 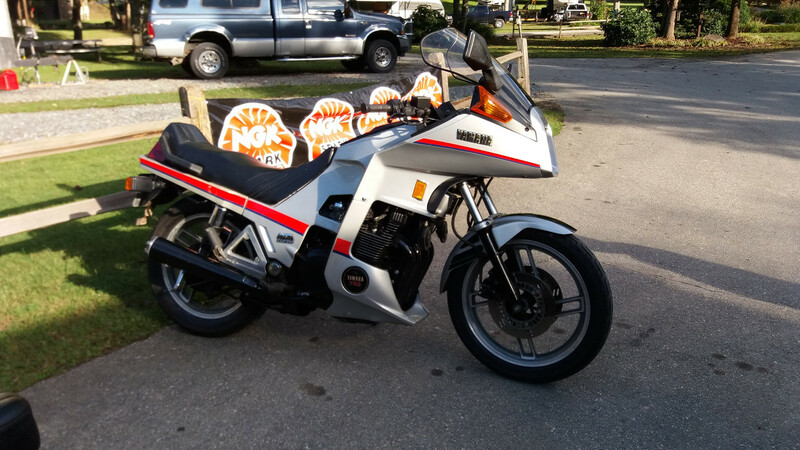 The rare Seca 650 Turbo was also a fun, FAST bike! It's problem was the handling, as it felt top heavy. Once the turbo spooled up, the bike was gone! I really liked mine, and would have put a lot more miles on it but for wet roads and someone in a car going too fast trying to get on the freeway. I've a very nice 79 I'm drooling over but no room, 6000 original miles, man says $1800 but $1500 will sell it, dang near new, rode it around the block, for a bike that has been ridden little, it runs very well, only problem, it's RED, I hate RED ! FWIW a RED (or whatever other colour you hate) XS650 can be the colour you want it to be with the careful use of a can of paint. What with the stock black frame & chrome fenders it's only the tank & sidecovers that need painting anyway, eh? But for losing that stock color, if your into keeping it stock ? I put a little higher value on certain stock colors like French Blue, Maxi Maroon, Black (why never a white or Ivory or Cameo and gold ?). if it's original paint and still looks OK, best leave it alone for authenticity's sake. OTOH if the dreaded PO has repainted it, who knows what may be underneath? One time I bought my boys a Kawi 90 that had been rattle-canned matte black. Careful application of acetone on a rag showed the Kawi's stock screaming green underneath still OK, just s bit faded. Nice! I’ve been wanting a carmine red one lately myself. I picked up a pretty nice faded red tank xs11 a while back and immediately pulled it off and let my buddy have it. I’ve been kicking myself ever since. It had the perfect patina...like an old barn with no dents or rust. Ooops, looks like I missed the whole second page!